[PENNSYLVANIA CONSTITUTION]. Broadside. An Alarm. To the Freemen and Electors of Pennsylvania. [Philadelphia, Pa.], October 1, 1784. 1 p., 16½ x 21 in. Please note that the traditional “long-style s” has been standardized. The day is now approaching on which you are to determine whether Pennsylvania shall enjoy a free and just government, or be ruled by the arbitrary wills of a few men who have lately composed the majority of the Council of Censors. I shall say nothing to you of their having refused to call a Convention to alter and amend the Constitution. It is well known that most of them disapprove of it; but they have sacrificed their judge-ments to their party resentments. Nor shall I dwell long upon the vast sum of money they have cost the state. Their wages and contingent expences, amount to nearly TEN THOUSAND POUNDS. The whole expences of the government for the current year will not fall short of FIFTY THOUSAND POUNDS. One half of this sum might be saved, by a few alterations in the Constitution: The remaining half, in a few years, would open roads to every part of the state, and remove the principal obstructions in the navigation of the Schuylkill and Susquehannah. Pennsylvania’s 1776 Constitution contained an unusual feature: it required a 24-member Council of Censors, to be chosen every seven years and tasked with revising the state Constitution. 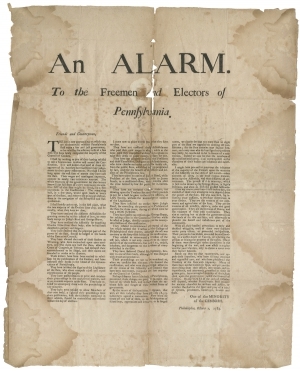 This broadside harangues the current censors, who “refused to call a convention to alter and amend the Constitution,” while showing favoritism and fiscal irresponsibility. “One of Minority of the Censors” further chastises his brethren as “the enemies of liberty and the violators of their own Constitution” and urges the citizens of Pennsylvania to resist. The Assembly finally called a constitutional convention in 1789 and revised in the Constitution in 1790. The new Constitution created a bicameral legislature elected by a general election of citizens, a governor elected for a three-year term, a judiciary appointed by the governor and removable through impeachment, and protection of rights. Unrestored: light dampstaining in margins, central vertical tear, edges chipped in several places.